If you're looking for the best small business routers of 2019, then you've come to the right place. In this guide we take a look at the very best wireless routers that are geared towards small and medium sized businesses - or home office use if you work from home. While the best small business routers in 2019 don't have the sheer horsepower that routers aimed at huge enterprises do (needed to handle large amounts of network traffic from all its employees), it doesn't mean these are under-powered routers that will fall over as soon as more than five people try to access a server. Modern routers now often come with dual or even triple band connectivity, as well as a slew of other features usually found on far more expensive enterprise-grade models, while costing considerably less. The complexity and requirements of running a wireless network these days mean that the best small business routers now have a much more varied feature set, as well as including hardware that’s often found in computers. Businesses will look for different features than most every day users: security, support, remote access, business grade VPN, WAN redundancy, connectivity options and scalability are more important than things like raw speed, value or QoS features. Asus has a reputation for manufacturing great consumer products and the Taiwanese firm – known for its laptops and motherboards – has been trying its hand at wireless products. The BRT-AC828 is its only business router and the device ticks a lot of boxes, even for small businesses looking for more than 10 simultaneous connections. Granted, it is excruciatingly expensive but packs the sort of features you’d never expect from a router like an M.2 slot to plug in an SSD to convert it into a mini-NAS. There’s a lot more here including support for RADIUS, the ability to aggregate four 1Gb Ethernet ports into a virtual 4Gb one (it has a mighty eight Gigabit Ethernet ports in all) and even support for LTE as a backup connection to improve resilience – the router already has two 1Gbps WAN ports that can be aggregated or used independently. As you’d expect from a top of the range router, it offers 4x4 MU-MIMO and theoretical speeds of up to 2.6Gbps with open plan coverage up to 100m (albeit on the 2.4GHz band). Asus has also partnered with Trend Micro to offer a built-in security package called AIProtection. If you want a good performing, no-nonsense router, then the Billion BiPAC 8900AX-2400 is well worth considering. Billion might not be as much of a well-known brand as some of the others on this list, but it has been around for more than a decade. We would especially recommend the BiPAC 8900AX-2400 to people with an ADSL2+ internet connection, as it can replace your existing modem as well. Of course, this involves a bit of tweaking – and it’s here that we offer a note of caution: this is a router suitable for people who are confident in setting up networks. If you want a plug-and-play stylish looking user-friendly router, this will not be for you. Don’t let its ugly looks (and the similarly clunky user interface) put you off, though: this is a great all-round router for your small business. Feature-wise, it can reach 2.4Gbps on both bands with an auto-failover feature should you connect a 3G/4G modem to its USB port. It is a bit lightweight compared to the competition in the connectivity stakes, though, with only four Ethernet ports and one USB 2.0 connector; but that’s reflected in its lower price. If you work in an office, and you’re ready to bring your networking into the modern age with one of the best routers for businesses, you seriously need to check out the Netgear Orbi Pro. It's a modular Wi-Fi mesh system, but it makes some design and performance changes that specifically cater to the business user. It’s not cheap, but if you run a business where you can’t afford anyone slowing down due to slow Wi-Fi, it’s worth every penny. Linksys is one of the most recognisable names in small business networking. It’s no surprise, therefore, that the company was one of the first to deliver a tri-band router which uses MU-MIMO technology – and a whopping eight antennas – to deliver two 2.17Gbps streams with an additional 1Gbps stream for legacy 2.4GHz devices. Managing three separate bands requires some serious firepower which is why there’s a dual-core 1.4GHz processor at the heart of the EA9500. Linksys recommends pairing the device with its own Max-Stream AC1900+ MU-MIMO Wi-Fi Range Extender to offer seamless roaming and improve coverage. Other than two USB ports, the router comes with a hefty eight LAN ports and a WAN port. There are no specific business features other than WPA2 enterprise wireless encryption – you won’t be able to bond Gigabit ports and there are no redundancy/failover options, or security extras. Nonetheless, the fact that this device can be controlled from an app makes it ideal for busy small businesses. Technically speaking, the Nighthawk X10 is a consumer router but like the Asus model above, it offers features that you will usually find on business routers. 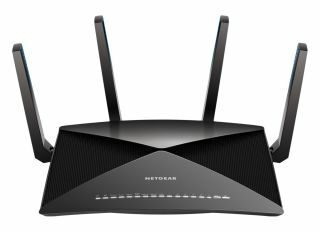 As technically advanced as most routers on this list, it is rated at 2600Mbps using 4x4 MU-MIMO and has plenty of LAN ports – seven Gigabit ones, in fact. You can aggregate a pair of them to reach 2Gbps and there’s even a 10G LAN SPF+ connector for NAS access (assuming you’ve got a device that supports this technology). Add in a pair of USB 3.0 ports and some powerful hardware (quad-core ARM processor clocked at 1.7GHz, 1GB RAM and 512MB storage) and you can see why this Netgear router will appeal to businesses as well as enthusiast-level consumers. Its most intriguing feature, though, has to be support for 802.11ad which is a short range, high-speed connectivity that requires line of sight to work properly. Also known as WiGig, it operates in the 60GHz spectrum and aims to replace wires altogether. One unexpected goodie included with the router is a 6-month subscription to Amazon Cloud Drive (double check which one, though, as Amazon killed the ‘unlimited’ tier mentioned in the marketing literature) and that’s a great bonus for backup purposes. The Synology RT2600ac is what you get when you fuse a traditional wireless router with a network-attached storage device or NAS (well, it gives you a bit more besides, too). The company is mostly known for its NAS boxes and while the modem doesn’t boast the beefiest specs or even a conventionally attractive shell like most of the competition, the RT2600ac packs a ton of features (like built-in VPN and the ability to aggregate two WAN ports) that make it worth your while. While it only has 4GB of storage built-in, you can connect an external hard drive and configure your own cloud service similar to Google Drive or Microsoft OneDrive. You can even download a selection of NAS-grade apps like a VPN client and server. Unfortunately, the app selection is sparse at the moment, and the ecosystem needs better community support – which hopefully it’ll get going forward. Though it’s not exactly fool-proof in terms of its setup process and the more complex functions it offers, the Synology RT2600ac is much more accessible than most NAS devices. Bear in mind that this is only Synology’s second attempt at devising a router of its own, so despite some shortcomings here, there’s plenty of room to improve.